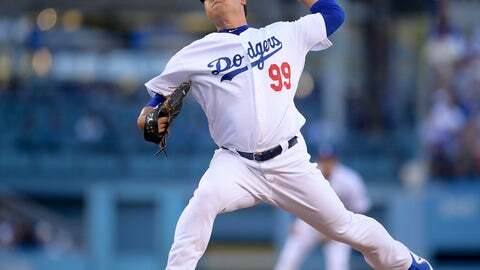 LOS ANGELES (AP) — The Dodgers made a surprising and much dissected decision to start Hyun-Jin Ryu over Clayton Kershaw in Game 1 of the NL Division Series. “A guy with his pedigree and his track record, we’re pretty excited to have him going tomorrow night,” Dodgers third baseman Justin Turner said of Kershaw. Ryu was 5-2 with a 1.15 ERA in nine starts at Dodger Stadium in the regular season. The Dodgers went 7-2 in those games. That’s the lowest ERA among pitchers with 50 or more innings at home, according to STATS. RHP Anibal Sanchez (7-6, 2.83 ERA) starts Game 2 for Atlanta. He is 2-4 with a 2.79 ERA in seven postseason starts. He last pitched in the playoffs in 2014 with Detroit. Kershaw (9-5, 2.73) goes for the Dodgers. The veteran ace is 7-7 with a 4.35 ERA in 24 postseason games. He gave up four homers in Game 1 of last year’s NLDS, the most allowed by a Dodgers pitcher in playoff history.